Neatly trimmed rice paddies spread out over the Shonai Plains. The plains are located in northeastern Japan. Photo from 1960. Many paddy fields were too small to benefit from mechanization, and traditionally farmers had owned scattered small plots of land rather than one large area. A farm household with scattered plots of land could buy and sell them separately, and plots with different growing conditions reduced the weather-related risks of farming. By the 1970s, farming villages all across Japan began to reorganize their landholdings and rebuild their paddies and dry fields to make more efficient use of small tractors and other farm equipment. On a village-wide basis, farmers swapped small individual plots of land to gain large land areas. 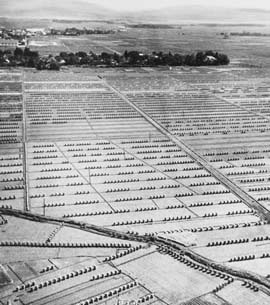 Then they reconfigured their paddies and dry fields to make larger rectangular fields that could be worked efficiently with machinery. Click on MAPS, below, to see a diagram of the small, scattered ricefields owned by two farms in the village of Niiike, Okayama, in the early 1950s. Click on CHARTS for more information about the size of farms in Japan.